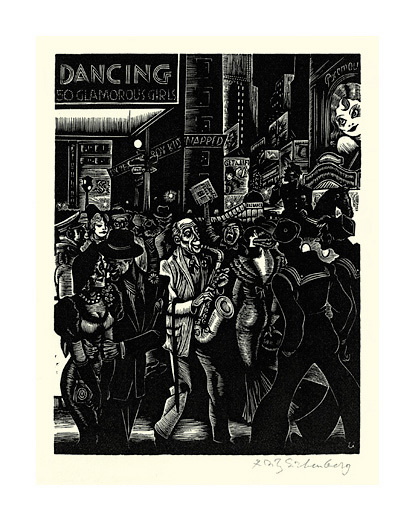 City Lights - - 1934, Wood Engraving. 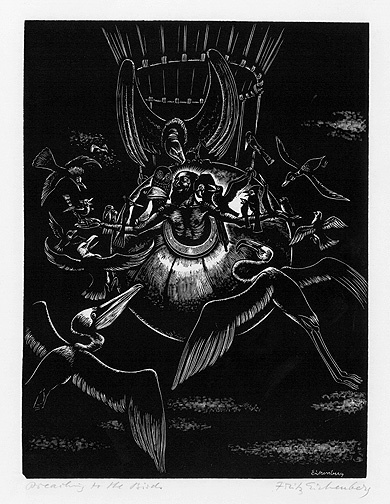 Edition 200, a proof before the numbered edition. Signed in pencil. Initialed in the block, lower right. Image size 6 1/4 x 4 3/4 inches (159 x 121 mm), sheet size 12 x 8 7/8 inches (305 x 225 mm). 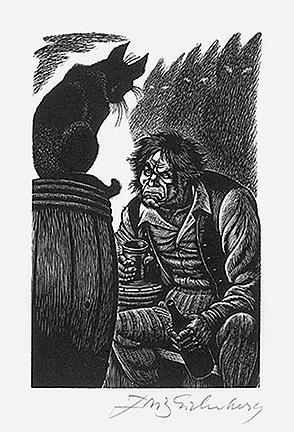 A fine, black impression, on cream wove paper, with full margins (2 1/8 to 3 1/4 inches); slight toning in the outer margins, otherwise in excellent condition. 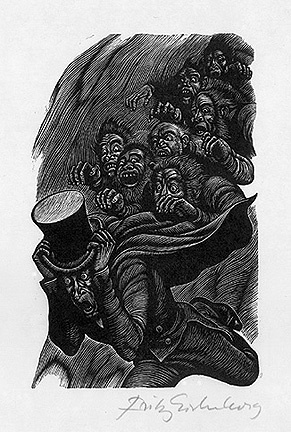 Printed by Ernest Roth. 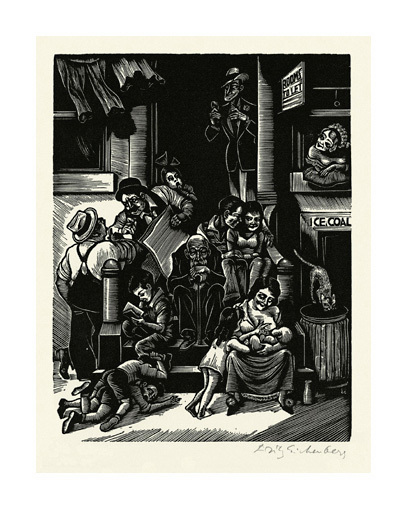 One of four early, self-published wood engravings representing Fritz Eichenberg's first impressions of New York City as an immigrant in 1933, at the height of the depression. 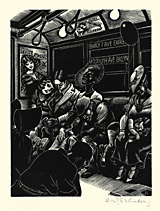 He recalls the period ..."exciting safaris into downtown Manhattan, my first ride on the infernal Seventh Avenue Subway, observations of life on the stoops and fire escapes of little Italy, in the streets of Harlem and Williamsburg, visits to the Aquarium and the speakeasies, and the sight of the ominous breadlines of the Bowery..."
The Steps - - 1934, Wood Engraving. Image size 6 1/4 x 4 3/4 inches (159 x 121 mm), sheet size 11 7/8 x 9 inches (302 x 229 mm). A fine, black impression, on cream wove paper, with full margins (2 1/8 to 3 5/8 inches); slight toning in the outer margins, otherwise in excellent condition. 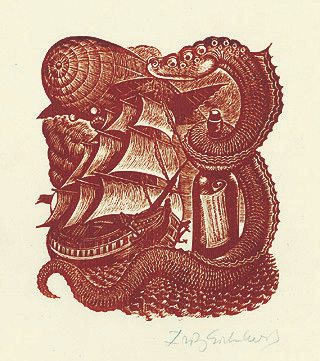 Printed by Ernest Roth. 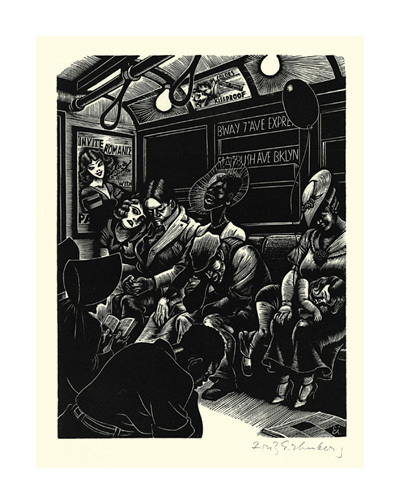 The Subway (Sleep) - - 1934, Wood Engraving. Image size 6 1/4 x 4 3/4 inches (159 x 121 mm), sheet size 12 x 9 inches (305 x 229 mm). A fine, black impression, on cream wove paper, with full margins (2 to 2 7/8 inches); slight toning in the outer margins, otherwise in excellent condition. 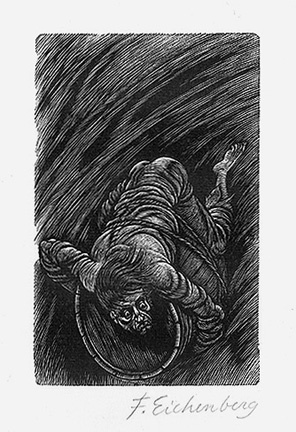 Printed by Ernest Roth. 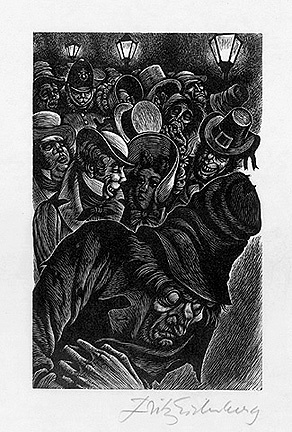 Reproduced: L’Amérique de la Dépression: Artistes Engagés des Années 30, Musée-Gallerie de la Seita, Paris, 1996; Pressed In Time: American Prints 1905-1950, Henry E. Huntington Library and Art Gallery, San Marino, 2007; The American Scene on Paper; Prints and Drawings from the Schoen Collection, Georgia Museum of Art, University of Georgia, 2008. 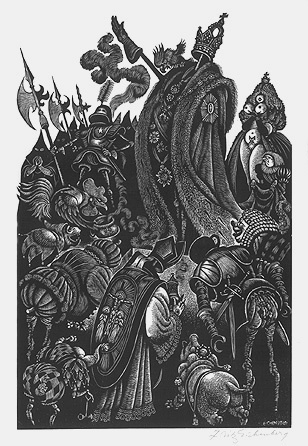 St. Francis Preaching to the Birds - - 1935, Wood Engraving. Edition none, proofs only. Signed and titled Preaching to the Birds in pencil, signed in the block, lower right. Image size 7 15/16 x 6 inches (202 x 152 mm); sheet size 11 5/16 x 8 3/4 inches (303 x 222 mm). A fine, black impression, with full margins (1 1/8 to 1 7/8 inches), on cream wove paper, in excellent condition. Scarce. 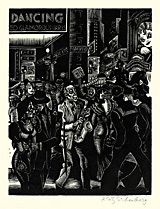 Created for the New York City WPA. Ex. 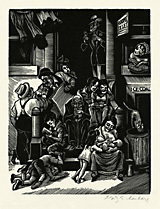 collection Audrey McMahon, Director, New York City WPA Art Project. Image size 5 1/2 x 3 9/16 inches (140 x 90 mm); sheet size 10 3/4 x 8 3/16 inches (273 x 208 mm). A fine, black impression, with full margins (1 11/16 to 3 9/16 inches), on cream wove paper, in excellent condition. Image size 5 1/2 x 3 9/16 inches (140 x 90 mm); sheet size 10 3/4 x 7 3/8 inches (273 x 187 mm). A fine, black impression, with full margins (1 7/8 to 3 1/16 inches), on cream wove paper, in excellent condition. Image size 5 1/2 x 3 9/16 inches (140 x 90 mm); sheet size 8 1/4 x 6 inches (210 x 152 mm). A fine, black impression, with full margins (1 1/4 to 1 1/2 inches), on cream wove paper, in excellent condition. Edition not stated. Signed and annotated E. A. Poe in pencil. Image size 5 9/16 x 3 9/16 inches (141 x 90 mm); sheet size 10 3/4 x 7 3/8 inches (273 x 187 mm). A fine, black impression, with full margins (2 to 3 inches), on cream wove paper, in excellent condition. Image size 5 1/2 x 3 9/16 inches (140 x 90 mm); sheet size 12 x 9 inches (305 x 229 mm). A fine, black impression, with full margins (2 3/4 to 3 13/16 inches), on cream Japan, in excellent condition. A fine, black impression, with full margins (2 1/2 to 3 5/8 inches), on cream Japan, in excellent condition. Image size 3 7/8 x 3 3/8 inches (98 x 86 mm); sheet size 9 x 5 15/16 inches (229 x 151 mm). A fine, rich impression, in brick red ink, with full margins (1 to 2 13/16 inches), on cream Japan, in excellent condition. Image size 5 1/2 x 3 9/16 inches (140 x 90 mm); sheet size 9 1/2 x 7 91/16 inches (241 x 192 mm). A fine, black impression, with full margins (2 inches), on cream Japan, in excellent condition. 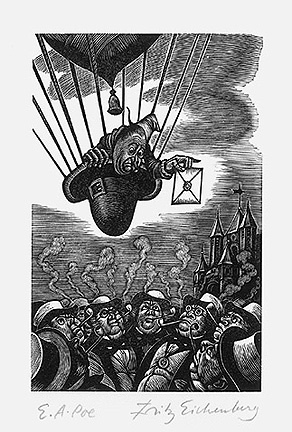 In Praise of Folly - - 1972, from a portfolio of 10 wood engravings. Renowned for its anti-establishment humor, Encomium Moriae (In Praise of Folly), by Desiderius Erasmus, was first published in 1511. 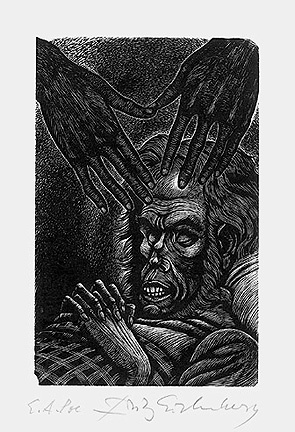 Long fascinated by the writings of Erasmus, Fritz Eichenberg made selections from the Latin for the subjects of this series of graphic works, freely translating them into English as text to accompany his art. 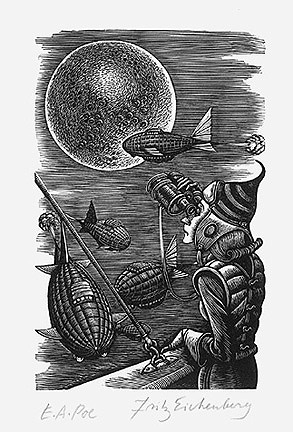 The wood engravings were printed by James Lanier of Aquarius Press, under the supervision of the artist, on hand made Japanese mulberry paper. The texts are set in Monotype Janson, and printed at The Press of A. Colish in Mount Vernon, New York, on Strathmore Impress paper. Typography and design are by Bert Clarke. 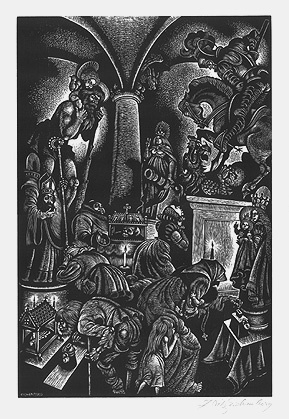 III - The Follies of Worshipping Idols - - 1972, Wood Engraving. Edition 150. Signed in pencil. Signed in the block, lower left. Image size 18 x 12 inches (457 x 305 mm); sheet size 20 x 13 7/8 inches (508 x 352 mm). A superb, black impression, on cream Japan, with full margins (13/16 to 1 1/8 inches), in excellent condition. With the accompanying text folder included in the original portfolio. 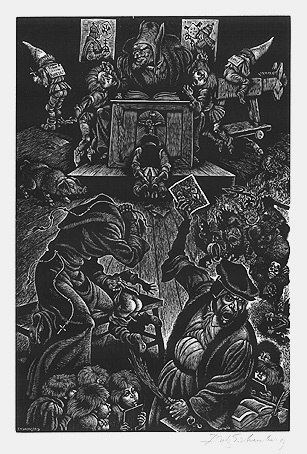 V - The Follies of Teaching - - 1972, Wood Engraving. Image size 18 x 11 7/8 inches (457 x 302 mm); sheet size 20 x 13 7/8 inches (508 x 352 mm). A superb, black impression, on cream Japan, with full margins (13/16 to 1 3/16 inches), in excellent condition. With the accompanying text folder included in the original portfolio. 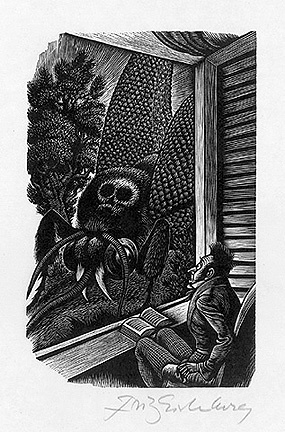 VIII - The Follies of the Court - - 1972, Wood Engraving. Edition 150. Signed in pencil. Signed in the block, lower right. Image size 18 x 11 15/16 inches (457 x 303 mm); sheet size 20 x 13 7/8 inches (508 x 352 mm). A superb, black impression, on cream Japan, with full margins (7/8 to 1 inch), in excellent condition. With the accompanying text folder included in the original portfolio. 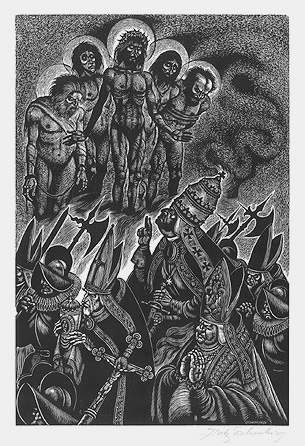 IX - The Follies of the Popes - - 1972, Wood Engraving. 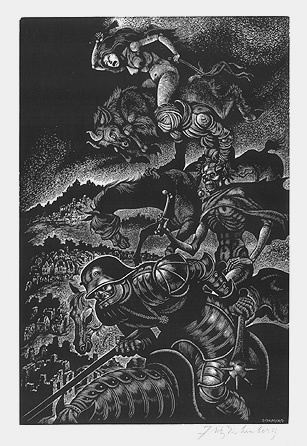 X - The Follies of War - - 1972, Wood Engraving. Image size 18 x 11 7/8 inches (457 x 302 mm); sheet size 20 x 14 inches (508 x 356 mm).